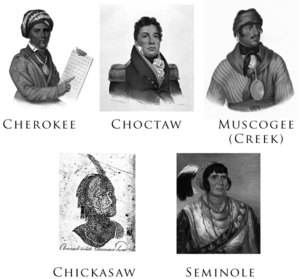 Gallery of the Five Civilized Tribes: Sequoyah (Cherokee), Pushmataha (Choctaw), Selocta (Muscogee/Creek), a "Characteristic Chicasaw Head", and Osceola (Seminole). The portraits were drawn or painted between 1775 and 1850. The term has been criticized for its ethnocentric definition of civilization. The Five "Civilized" Tribes were indigenous peoples of the Americas who lived in the Southeastern United States. Most were descendants of what is now called the Mississippian culture, an agrarian culture that grew crops of corn and beans, with hereditary religious and political elites. The Mississippian Culture flourished in what is now the Midwestern, Eastern, and Southeastern United States from 800 to 1500. Before European contact these tribes were generally matrilineal societies. Agriculture was the primary economic pursuit. The bulk of the tribes lived in towns (some covering hundreds of acres and populated with thousands of people). These communities regulated their space with planned streets, subdivided into residential and public areas. Their system of government was hereditary. Chiefdoms were of varying size and complexity, with high levels of military organization. George Washington and Henry Knox pursued an agenda of cultural transformation in relation to Native Americans. The Cherokee and Choctaw tended, in turn, to adopt and appropriate certain cultural aspects of the federation of colonies. At the time of the Declaration of Independence, the culture of the United States as a nation was, itself, emergent. Many of the cultural practices appropriated by The Five Tribes were ones that they found useful. In the early part of the 19th century, the U.S. government initiated a displacement of the existing societies living east of the Mississippi River, including The Five Tribes, to lands west of the river. This displacement initiative, dubbed the Indian Removal, forced a significant number of the Five Tribes to Indian Territory in other parts of the North American continent. A significant number were displaced to the area that would, in future, become the state of Oklahoma. At the time of their removal, the tribes were suzerain nations. 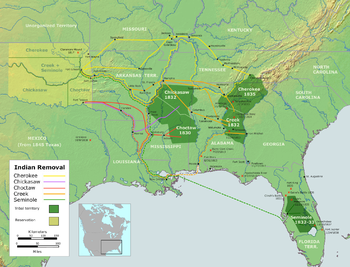 The federally legislated displacement of the tribes from their homes east of the Mississippi River took place over several decades during the series of removals, which is also known as the Trail of Tears. The territory to which they were displaced was, at the time, called Indian Territory, currently eastern Oklahoma. The most infamous removal was the Cherokee Trail of Tears of 1838, when President Martin Van Buren enforced the contentious Treaty of New Echota with the Cherokee Nation. One point of contention regarding the treaty is whether it is an instrument of mass displacement in violation of the human rights on which the new republic had been established, or a legal exchange of territory for land further west. During the American Civil War, the politics of the Five Tribes were divergent. The Choctaw and Chickasaw fought predominantly alongside the Confederates while the Creek and Seminole fought alongside the Union. The Cherokee fought a civil war within their own nation between the majority Confederates and the minority, pro-Union camps. As an element in Reconstruction after the Civil War, new Reconstruction Treaties were signed with the indigenous nations that had entered into treaties with the Confederate States of America. The Civil War was not good to the tribes. The first three battles of the Civil War were fought in Indian territory, with some tribes joining treaties with the Confederates, and others with the Union. Once the tribes had been relocated to Indian Territory, the United States government promised that their lands would be free of white settlement. Some settlers violated that with impunity, even before 1893, when the government opened the "Cherokee Strip" to outside settlement in the Oklahoma Land Run. In 1907, the Oklahoma Territory and the Indian Territory were merged to form the state of Oklahoma. Relative to other states, all Five Tribes are represented in significant numbers in the population of Oklahoma today. Washington promulgated a doctrine that held that American Indians were biologically equals, but that their society was inferior. He formulated and implemented a policy to encourage the "civilizing" process, which Thomas Jefferson continued. The noted Andrew Jackson historian Robert Remini wrote "they presumed that once the Indians adopted the practice of private property, built homes, farmed, educated their children, and embraced Christianity, these Native Americans would win acceptance from white Americans. Washington's six-point plan included impartial justice toward Indians; regulated buying of Indian lands; promotion of commerce; promotion of experiments to civilize or improve Indian society; presidential authority to give presents; and punishing those who violated Indian rights. The government appointed agents, like Benjamin Hawkins, to live among Indians and to encourage them, through example and instruction, to live like whites. The tribes of the southeast adopted Washington's policy as they established schools, took up yeoman farming practices, converted to Christianity, and built homes similar to those of their colonial neighbors. —  Henry Knox, Notes to George Washington from Henry Knox. It is notable that the legal systems among the five tribes reputedly appropriated slavery. The Cherokee, (/ˈtʃɛrəkiː/; Cherokee Ani-Yunwiya (ᎠᏂᏴᏫᏯ)) are people of the Southeastern United States, principally upland Georgia, North Carolina and South Carolina. They speak an Iroquoian language. In the 19th century, historians and ethnographers recorded their oral tradition that told of the tribe having migrated south in ancient times from the Great Lakes region, where other Iroquoian-speaking peoples were. Of the three federally recognized Cherokee tribes, the Cherokee Nation and the United Keetoowah Band of Cherokee Indians (UKB) have headquarters in Tahlequah, Oklahoma. The UKB are mostly descendants of "Old Settlers", Cherokee who migrated to Arkansas and Oklahoma about 1817. They are related to the Cherokee who were forcibly relocated there in the 1830s under the Indian Removal Act. The Eastern Band of Cherokee Indians is on the Qualla Boundary in western North Carolina, and are descendants of those who resisted or avoided relocation. In addition, there are numerous Cherokee heritage groups throughout the United States, such as the satellite communities sponsored by the Cherokee Nation. The Cherokee tribe is the largest tribe in the nation, having 729,533 members. The Chickasaw are Native American people of the United States who originally resided along the Tennessee River and other parts of Tennessee, west of present-day Huntsville, Alabama, parts of Mississippi and the southwest side of Kentucky. They spoke some French and some English. Some historians credit the Chickasaws' intervention in the French and Indian War on the side of the British as decisive in ensuring that the United States became an English-speaking nation. Originating further west, the Chickasaw moved east of the Mississippi River long before European contact. All historical records indicate the Chickasaw lived in northeastern Mississippi from the first European contact until they were forced to remove to Oklahoma, where most now live. They are related to the Choctaws, who speak a similar language, both forming the Western Group of the Muskogean languages. "Chickasaw" is the English spelling of Chikasha (Muskogee pronunciation: [tʃikaʃːa]), that either means "rebel" or "comes from Chicsa". The Chickasaw are divided in two groups: the "Impsaktea" and the "Intcutwalipa". The Chickasaws were one of the "Five Civilized Tribes" who went to the Indian Territory during the era of Indian Removal. Unlike other tribes, who exchanged land grants, the Chickasaw received financial compensation from the United States for their lands east of the Mississippi River. The Chickasaw Nation is the thirteenth largest federally recognized tribe in the United States. The Chickasaws built some of the first banks, schools, and businesses in Indian territory. They also signed a treaty with the Southern United States during the Civil War and brought troops to fight for the Confederates. The Choctaw are a Native American people originally from the Southeastern United States (Mississippi, Alabama and, to a lesser extent, Louisiana). There were about 20,000 members of this tribe when they were forced to move to Indian territory. Many of them did not survive. They are of the Muskogean linguistic group. The word Choctaw (also rendered as Chahta, Chato, Tchakta, and Chocktaw) is possibly a corruption of the Spanish chato, meaning flattened, in allusion to the tribe's custom of flattening the heads of infants. Noted anthropologist John Swanton, however, suggests that the name belonged to a Choctaw leader. They were descended from people of the Mississippian culture which was located throughout the Mississippi River valley. The early Spanish explorers, according to the historian Walter Lee Williams, encountered their ancestors. Although smaller Choctaw groups are located in the southern region, the Choctaw Nation of Oklahoma and the Mississippi Band of Choctaw Indians are the two primary Choctaw associations. This tribe was predominantly farmers (like most Indians were at the time) until they were removed from their land. They have grown substantially since the Trail of Tears and there are currently about 231,000 members, making the Choctaw the third largest Native American population in the United States. The capital of the Choctaw Nation is currently located in Tuskahoma, Oklahoma. The Muscogee Creek are an American Indian people originally from the southeastern United States, specifically Georgia, Florida, South Carolina, and Alabama. They were there from around 1500 AD till they were forced out by the American Government in the early 19th century. Mvskoke is their name in traditional spelling. The Muscogee Creek tribe is not one tribe but a group of several tribes, each of which had their own distinct land. Starting in 1836, the U.S. forced them to move west of the Mississippi along with the other civilized tribes to "Indian territory". About 20,000 Muscogee members were forced to walk the Trail of Tears, the same amount as the Choctaws. Modern Muscogee live primarily in Oklahoma, Alabama, Georgia, and Florida. Their language, Mvskoke, is a member of the Creek branch of the Muskogean language family. The Seminole are related to the Muscogee and speak a Creek language as well. Federally recognized Creek tribes included the Muscogee Creek Nation, Poarch Band of Creek Indians in Alabama, Alabama-Quassarte Tribal Town, Kialegee Tribal Town, Thlopthlocco Tribal Town, and the Miccosukee Tribe of Indians of Florida. The Seminole are a Native American people originally of Florida and now residing in Florida and Oklahoma. The Seminole nation came into existence in the 18th century and was composed of renegade and outcast Native Americans from Georgia, Mississippi, and Alabama, most significantly the Creek Nation, as well as African Americans who escaped from slavery in South Carolina and Georgia. While roughly 3,000 Seminoles were forced west of the Mississippi River, including the Seminole Nation of Oklahoma, who picked up new members along the way, approximately 300 to 500 Seminoles stayed and fought in and around the Everglades of Florida. In a series of United States wars against the Seminoles in Florida, about 1,500 U.S. soldiers died. The Seminoles never surrendered to the US government, and consequently the Seminole of Florida call themselves the "Unconquered People". Federally recognized Seminole tribes today include the Seminole Nation of Oklahoma and Seminole Tribe of Florida. For about twenty years after the move to Indian Territory (Oklahoma), the Seminoles refused to live with the Muscogee Creek tribe or under their Government until they finally reached an agreement with the Government to sign a treaty and live with them. The Seminoles favored the North during the Civil War and remained loyal to the Union and proceeded to move north into Kansas. The term "civilized" has historically been used to distinguish the Five Tribes from other Native American groups that were formerly often referred to as "wild" or "savage". Texts written by non-indigenous scholars and writers have used words like "savage" and "wild" to identify Indian groups that retained their traditional cultural practices after European contact. As a consequence of evolving attitudes toward ethnocentric word usage and more rigorous ethnographical standards, the term "Five Civilized Tribes" is rarely used in contemporary academic publications. The word "civilized" was used by whites to refer to the Five Tribes, who, during the 18th and early 19th centuries, actively integrated Anglo-American customs into their own cultures. Sociologists, anthropologists, and interdisciplinary scholars alike are interested in how and why these native peoples assimilated certain features of the alien culture of the white settlers who were encroaching on their lands. The historian Steve Brandon asserts that this "adaptation and incorporation of aspects of white culture" was a tactic employed by the Five Nations peoples to resist removal from their lands. While the term "Five Civilized Tribes" has been institutionalized in federal government policy to the point that the US Congress passed laws using the name, the Five Nations themselves have been less accepting of it in formal matters, and some members have declared that grouping the different peoples under this label is effectively another form of colonization and control by white society. Other modern scholars have suggested that the very concept of "civilization" was internalized by individuals who belonged to the Five Nations, but because much of Native North American history has been communicated by oral tradition, little scholarly research has been done to substantiate this. In present-day commentary on Native American cultures, the term "civilized" is contentious and not commonly used in academic literature. Some commentators, including the Indian activist Vine Deloria, Jr., have asserted that it is demeaning and implies that the indigenous peoples of the North American continent were "uncivilized" before their contact with the habits, customs, and beliefs of Anglo-American settlers. The term is based on the assumption that different peoples possess objective "degrees" of civilization that may be assessed and raises the question of just what qualities define "civilization". Consequently, it is considered a judgmental term whose meaning is dependent on the user's perspective, and thus best avoided. ^ Clinton, Fred S. Oklahoma Indian History, from The Tulsa World. The Indian School Journal, Volume 16, Number 4, 1915, page 175-187. ^ Barry Pritzker (2000). A Native American Encyclopedia: History, Culture, and Peoples. Oxford University Press. p. 389. ISBN 978-0-19-513877-1. ^ "Five Civilized Tribes". Encyclopedia of Oklahoma History & Culture. Oklahoma Historical Society. Retrieved 2015-01-22. ^ "The Native People of North America: Southeast Culture Area". Retrieved 2012-05-27. ^ a b "Muscogee (Creek) Nation". Muscogeenation-nsn.gov. Retrieved 2015-10-18. ^ a b Remini, Robert (1998) . "The Reform Begins". Andrew Jackson. History Book Club. p. 201. ISBN 0-9650631-0-7. ^ a b Miller, Eric (1994). "George Washington And Indians". Eric Miller. Retrieved 2 May 2008. ^ Mooney, James (1900). Myths of the Cherokee and Sacred Formulas of the Cherokees. 393: Kessinger Publishing. ISBN 978-1-4286-4864-7. ^ William L. Anderson; Ruth Y. Wetmore; John L. Bell (2006). "Cherokee Indians - Part 5: Trail of Tears and the creation of the Eastern Band of Cherokees | NCpedia". Encyclopedia of North Carolina www.ncpedia.org. State Library of North Carolina. Retrieved 21 January 2019. ^ "The Official Site of the Chickasaw Nation | History". Chickasaw.net. 2014-10-31. Retrieved 2015-10-18. ^ Jesse Burt & Bob Ferguson (1973). "The Removal". Indians of the Southeast: Then and Now. Abingdon Press, Nashville and New York. pp. 170–173. ISBN 0-687-18793-1. ^ "Choctaw History". Fivecivilizedtribes.org. Retrieved 2015-10-18. ^ Frederick Webb Hodge (1907). ... Handbook of American Indians North of Mexico: A-M. U.S. Government Printing Office. p. 288. ^ Horatio Bardwell Cushman (1899). History of the Choctaw, Chickasaw and Natchez Indians. Headlight printing house. p. 564. ^ Williams, Walter (1979). "Southeastern Indians before Removal, Prehistory, Contact, Decline". Southeastern Indians: Since the Removal Era. 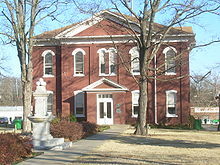 Athens, Georgia: University of Georgia Press. pp. 7–10. ^ "History". Choctaw Nation. Retrieved 2015-10-18. ^ "To the Brothers of the Choctaw Nation". Yale Law School. 1803. Retrieved 24 October 2010. ^ Mark I. Greenberg; Samuel Proctor; William Warren Rogers; Canter Brown (1997). Mark I. Greenberg; William Warren Rogers; Canter Brown (eds.). Florida's heritage of diversity: essays in honor of Samuel Proctor. Sentry Press. p. 84. ISBN 978-1-889574-03-5. ^ "Seminole History". DOS.Myflorida.com. Florida Department of State. 2016. Archived from the original on May 30, 2016. Retrieved 7 August 2016. ^ "Seminole History". Fivecivilizedtribes.org. Retrieved 2015-10-18. ^ Thomas Donaldson; Fletcher Meredith; John Davidson; John W. Lane (1894). Revised by editors of the United States Census Office. 11th Census, 1890 (ed.). Indians : the Five Civilized Tribes in Indian Territory: The Cherokee, Chickasaw, Choctaw, Creek, and Seminole Nations. United States Census Printing Office. p. 7. ^ Robert M. Lewis (21 January 2008). "Wild American Savages and the Civilized English: Catlin's Indian Gallery and the Shows of London". European Journal of American Studies. 3 (3–1): 13, 15. doi:10.4000/ejas.2263. ISSN 1991-9336. Retrieved 31 January 2019. ^ a b Theda Perdue; Michael D Green (22 June 2005). The Columbia Guide to American Indians of the Southeast. Columbia University Press. p. 101. ISBN 978-0-231-50602-1. ^ Vine Deloria, Jr. (28 June 2010). Behind the Trail of Broken Treaties: An Indian Declaration of Independence. University of Texas Press. p. 9. ISBN 978-0-292-78946-3. ^ Jennifer McClinton-Temple; Alan Velie (12 May 2010). Encyclopedia of American Indian Literature. Infobase Publishing. pp. 118–119. ISBN 978-1-4381-2087-4. ^ Grant Foreman (1934). The Five Civilized Tribes. University of Oklahoma Press (Reprinted 17 April 2013). p. 13. ISBN 978-0-8061-8967-3. ^ Linda W. Reese; Patricia Loughlin (15 August 2013). Main Street Oklahoma: Stories of Twentieth-Century America. University of Oklahoma Press. pp. 24–25, note 2. ISBN 978-0-8061-5054-3. ^ University of Akansas staff (January 10, 2019). "The term "Five Civilized Tribes"". University of Arkansas Libraries. Archived from the original on January 21, 2019.